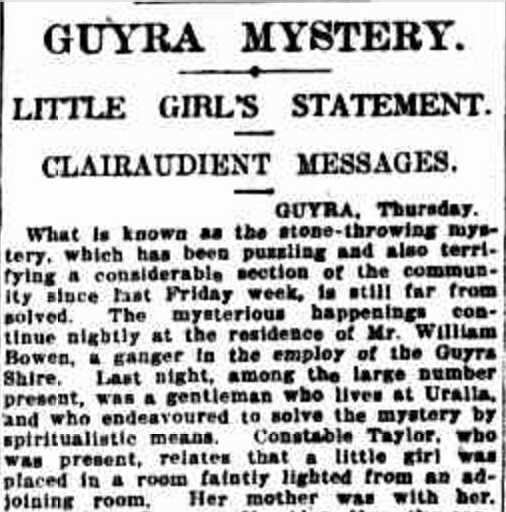 Excerpt from a newspaper article about the Guyra Ghost. The Guyra Ghost Mystery is a 1921 Australian movie by John Cosgrove which is considered to be lost. It is based on the real-life accounts of a family living in Guyra, South Wales. The real family involved in the attacks supposedly showed up in the film. The film follows a family that suffers from unexplained attacks on their house, including loud banging and showers of rocks being thrown at the house. Police had to surround the house and even kept a close look out for the family, but the attacks continued. One of the children (Minnie) admitted to throwing rocks at the house and making some noise to scare her sibling, but events proved she couldn't have been a suspect. When Minnie came back from a visit to her Grandma, who stayed at the Glenn Inn, the events seemed to cease. Little information about the film has survived, and no known footage exists. ↑ Wikipedia article. Retrieved 19 Mar '16. ↑ Newspaper article about the family involved. Retrieved 19 Mar '16.